Note: To my readers who have followed the blog, it will go fairly quiet now, with perhaps an occasional post from time to time. I'm not in-world enough in SL or OpenSim to justify more, and my other writing beckons. Thanks for all your comments and ideas over the years. 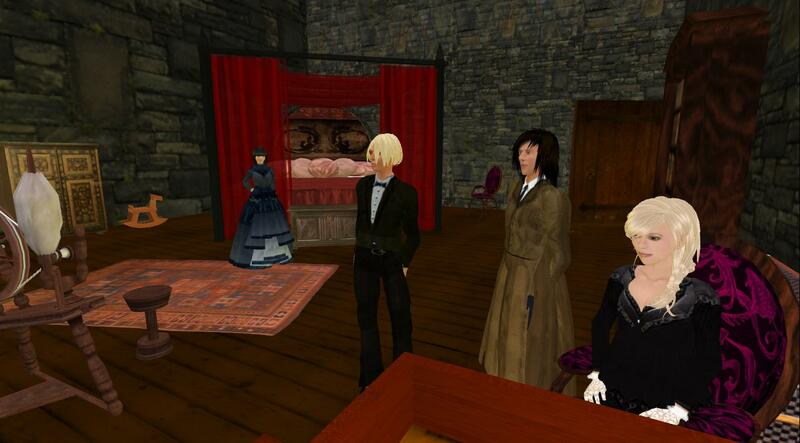 My students had a lot to say about my final experiment with virtual worlds. I'd suggest these critical remarks, following what they liked, may help others playing with interactive fiction using virtual worlds or other technologies. As you read them, you'll notice conflicting desires. I suspect the most popular sort of interactive literary experience will steer between constraint and complete freedom. I'll leave that up to others to try. Too Much or Too Little Freedom? Although the freedom of virtual simulation enables a more personal experience with the story, the freedom is to the detriment of the author’s intent. By providing so much freedom in the story, the meaning behind the story gets lost. In addition, the agency given to the avatars permits characters to get lost, die, or make another mistake that removes them from the storyline. One thing that was detrimental about having so much freedom was the fact that we could go anywhere we wanted even when we were not supposed to. There were several times that I ended up In a room I wasn’t supposed to find, or followed Madeline upstairs when she was trying to do something secretively. That may have been a glitch in the software, or we may have just been too clever, but it made the experience a little confusing. Having read the story prior to the interactive experience, I felt that the simulation lacked depth because it did not hold the same meaning that Poe intended it to, which I find to be an injustice to the great author. In fact, the storyline in my experience not only lacked depth but also action because most of the simulation was dialogue among the avatars. Though the conflict in Poe’s story involves a live burial and revenge, the conflict in my simulation simply had to do with Madeline’s doctor not being exactly who Roderick thought he was. This ultimately led the online story to not be extremely engaging. Even though the story was quite interesting, the final outcome was limited – Madeline either lives or dies. A simulation of a story with broader plot and more characters might also result in better experience. If I could fix anything about the way this final was conducted, I would make the simulation contain more action. We reached a certain point where I got bored with the large amount of conversation and the lack of more engaging activity. Maybe in the future, this final exam simulation could contain a battle of some sort. The characters could fight a ghost trying to attack them or a doctor trying to take Madeline away for experimenting, or have some other type of fun and unexpected action-based conflict. I thought the setting could have been improved. The House of Usher is supposed to be a scary place, however the larger, open rooms, bright Victorian furniture, and wider hallways failed to frighten. I would have liked to see the house’s hallways and rooms more damp, dark, and crowded. This virtual house also wasn’t as effective as Poe’s writing because a depiction of the setting makes it evident that Poe’s descriptions are now clichéd. More accessible clues would have certainly been helpful: perhaps hints to secrets hidden around the house or scavenger hunt-type clues. At a certain point during the simulation, I felt stuck given the information that I currently had and was not sure how to proceed—notes that led me to specific locations would have helped keep me on the move. In addition to this, interactive items would have been more than welcome and probably a lot of fun. I felt useless in the crypt when I was being shot at by the doctor and did not have a weapon. The ability to use objects, especially weapons, would definitely have made me feel more integrated into the story. The more that a character can physically do, the more lifelike a simulation feels. I also think that searching for clues and interacting with the house could have been a bigger component. Speaking with the actors playing Roderick and Madeleine was an important and interesting part of the experience, but got a little repetitive and boring during the first half of the simulation. One sad coda to my work of 6 years with virtual worlds: not a single student mentioned the Usher project in their formal class evaluations. In fact, I believe that the time spent preparing for Usher hurt my other teaching, and thus my evaluations overall. It will be a long time, if ever, that I use this technology with undergraduates. I don't expect SL to thrive again in the way that it was thriving when this blog began, in its original format, in 2007. That said, I wish those in SL's niche-universe good luck. If something like SL becomes popular with the somewhat jaded and very careerist students I teach, I'll give it another go. Until then, so long and thanks for all the prims. Joe, you are a brave soul and a true pioneer. It has been an absolute pleasure to call you colleague and friend for lo these many years. Lol! Chief, you always threaten to stop doing this but you're not fooling me. This was an invaluable post nonetheless. Basically, the Usher experiment was akin to somebody trying to tell an oral story to a bunch of kids with ADD who are allowed to do whatever they want while the story is being told. Having said that, I could, however, see how fiction (new and old) can make use of the virtual platform. You certainly took a logical approach to it but I think it just requires reassessing what it is you are trying to teach kids about Poe. Is it his themes? Him and his era? The concepts of fear and horror? How to tell a scary story? I think there is the potential to give kids the ability to answer these questions through the medium of their choice. Reading POE is one way to experience his kind of storytelling. Could kids be taught how to convey a Poe-like story through a technological medium? I think so. C'mon admit it....you like being on the cutting-edge. And you'll get no sympathy from me. Never say never, Cecil. But I don't HAVE a class suitable for virtual-worlds work for at least 3 years.